Telegram has introduced a new feature in its mobile app. Called Passport, it's a way for you to store your personal information within the app and then share it easily when another app or website requires it. 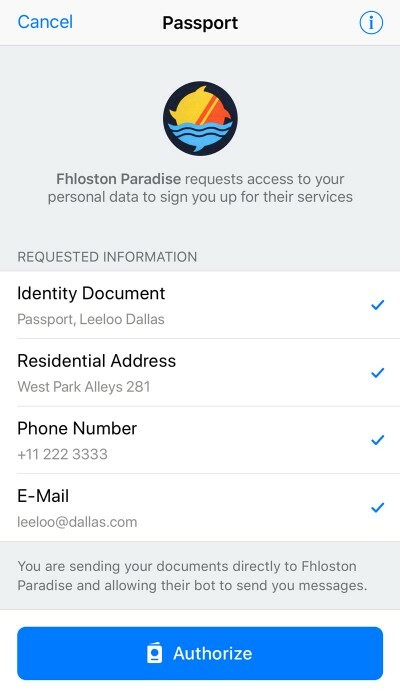 For a service to request information, it will have to integrate Telegram Passport in its app or website. You'll then see an option to Login with Telegram. Then, just like Facebook, Twitter or Google login, you will be able to login to the service using your Telegram credentials. You can enter your email, your phone number, your address and your identity document, such as a passport, driver's license, identity card or just manually enter all your credentials. The app will automatically fill in all the information to a site requesting it. By now it must be ringing alarm bells in your head, as it should. First of all, Telegram Passport is password protected, and you need to enter it every time a service needs you to login or even to open the Passport on the app. Next, Telegram claims the information inside the Passport is end to end encrypted, meaning between you and the service to which you provide the information, no one else, not even Telegram can read the information stored inside the Passport. The information is currently stored in Telegram's cloud server in encrypted form but the company promises to move it to a decentralized cloud in the future. A decentralized cloud spreads information across multiple computers (the way blockchain works) so no one has all the information at once, making it even more secure. As of now, ePayments.com is the only site to use Telegram login feature but I suppose more should show up in future. Strangely enough, the Passport option did not show up directly even after updating to the new version of the app. I had to go to Telegram's test page that lets you see how the feature work for it to activate the feature. There you have to first set a password, then enter a recovery email. Only after it sends you a link to your email to activate your account does it start working and you can enter information into it. You can also delete your Passport at any point, and all the information inside should get deleted. It's understandable to be skeptical. Even as a long-time Telegram user, I'm not exactly rushing to fill it up with all my private detail. There are also hardly any services available right now that use it so I have fewer reasons to use it. As for the future, it's hard to say; Telegram has a mixed track record with security so it's best to be a bit skeptical and not put all your eggs in this basket (or any other). Google, Amazon & eBay/PayPal already have my 'real' personal information ... already too many. I'm not letting another corporation have it. Telegram is my app of choice for private messaging.